Nothing short of world-famous! Costa Rican coffee is esteemed by connoisseurs around the globe. And it has played a vital role in Costa Rica's development as a nation. The history of coffee in this small Central American country dates back to the late 18th century. While coffee plants were originally native to Ethiopia, a special blend cultivated in Saudi Arabia was brought to Costa Rica in 1779, earning the name Arabica. More than 100 years later, on December 4, 1989, the government of Costa Rica ordered that no other coffee bean besides Arabica could be grown in the country. This executive order is the only of its kind. Costa Rica continues to attract global recognition in the coffee industry. Its coffee is high in caffeine and the best vintages deliver a lively acidity. Caturra, Mondo Novo and Catuai are the coffee varieties most commonly used. They produce beans that, when properly roasted and brewed, deliver a scrumptious cup-o-java. Caturra is often characterized as "bright and full-bodied with vivid fragrances of yellow fruits and honey." Coffee is a major Costa Rican export and you can easily buy and enjoy the best coffees from the country's most prestigious growing regions. So where exactly are these incredible coffee beans grown? There are seven coffee-producing regions in Costa Rica and more than 100,000 coffee plantations of variable size. Changes in elevation, humidity and temperature render distinct flavors to maturing beans, so each region's coffee has its own "personality". NOTE: Beans grown at the highest altitudes, above 3900', are distinguished as SHB (strictly hard bean). SHB coffee grows more slowly; its beans are dense and embody characteristics more desirable than beans from lower elevations. Tarrazu is located in central Costa Rica. Coffees produced on the fertile volcanic hillsides of Tarrazu are considered superior, "full-bodied with more aromatic complexity". There are several favored SHB plantations in this high-altitude region that deliver exceptional beans. In fact, Tarrazu's coffee plantations produce over half of the country's coffee. La Minita is perhaps the most sought after coffee in all of Costa Rica. It comes from Hacienda La Minita in the mountainous Tarrazu region. Tres Riós ("Three Rivers") region of Costa Rica is known as the Bordeaux of Costa Rica. Vibrant SHB coffees from this high-altitude region are described as "well balanced and sweetly smooth". Situated just east of San Jose in the Costa Rican interior near the Irazu Volcano, this region has a very specific microclimate and its coffee reflects that uniqueness. Meseta Central (Central Valley) is a high-altitude growing region that includes San Jose, Heredia, and Alajuela. It was home to Costa Rica's very first coffee plantations. Celebrated for its special chocolaty flavor, SHB coffee from the Central Valley continues to be extremely popular with international buyers. Valle Occidental (Western Valley) coffee beans are acclaimed for their unmistakable peach and apricot flavor. The high-altitude SHB coffee from this region has excellent acidity and good aroma. Brunca is located in southern Costa Rica. Although Brunca is a mid-altitude region, its beans are recognized for their thickness and exceptional acidity. Good body and aroma also characterize the coffee. Orosi is another middle-altitude coffee-growing region. It is renowned for its fertile soil and exceptional climate and the coffee is of superb quality. Beans from Orosi have a long, uniform shape. Turrialba is the lowest-altitude growing region in Costa Rica. Positioned at around 2000-3000' and nestled amid the larger coffee regions, beans from Turrialba are good-sized but have lower acidity. The coffee may have less body but it is praised for good aroma. How is Costa Rican Coffee Processed? The tradition and skill of growing, milling and sun-drying coffee beans have been passed down in families for generations. They continue to be an important part of Costa Rican heritage. From berry to bean. Coffee beans are actually the seeds inside the coffee fruit—there are two seeds, or beans, per berry. The coffee fruits are sometimes called "cherries" because the dark green skins ripen to a deep glossy red. To ensure proper ripeness at harvesting, "cherries" are hand-picked from among the leaves of the coffee bush. Fresh "cherries" are trucked to a processing plant. There, the pulp (outer layer of fruit) is scrubbed off and a gummy substance surrounding the beans is dissolved away. Sun dried to perfection. Because newly exposed beans are moist, they must be spread in the sun to dry. After that, a machine rubs off the leathery skin. Finally, the beans are sorted by size and shape and vacuum-sealed to retain their rich cherished fragrance. Once packaged, the treasured Costa Rican beans make their way to stores and cafes around the world where their savory taste and texture satisfy coffee-loving consumers. Ahhh… that delicious coffee smell. Until recently, the pulp from coffee processing plants was regularly dumped in local rivers. The enforcement of health laws has stopped most polluting. Now the pulp is sometimes returned to the plantation to be used as fertilizer. "Green" beans are best. No, not the color green. Like other agricultural businesses, Costa Rican coffee plantations are focused on keeping their crops sustainable. Words you should become familiar with are Shade-Grown, Organic, and Fair Trade. Shade-Grown coffee is said to offer more complex flavors because the "cherries" take longer to ripen. Coffee is a small shrub that traditionally grows in the shade of forest trees. Near the forest there are greater numbers of pollinators, less weeds, and some protection from the elements. Shade-Grown coffee is traditional in Costa Rica. However, in order to speed ripening time, some coffee plantations began seeking sunnier conditions. Many cut down surrounding forests, breaking the chain of biodiversity that ensures sustainability. So conscientious consumers are now buying Shade-Grown coffee. Because Arabica beans thrive with up to 65% shade, Costa Rica is better positioned to meet this growing market demand. Organic means no chemical fertilizers or pesticides were used on the crop. In this health-conscious era, nobody likes the idea of drinking coffee potentially tainted with chemicals. Plus, we need to protect local habitat and pollinators so farmers can keep the coffee coming for at least another 200 years. Fair Trade is a term used to suggest the product is produced and sold under better socio-economic standards than might otherwise be expected in a developing nation. Costa Rica exports about 90% of its coffee harvests, representing 15% of the country's total export revenue. Due to low unemployment in Costa Rica and a higher standard of living, many of the locals do not want to work for the minimum coffee-picking wage set by the government. So, Nicaraguan immigrants often cross the border to do seasonal labor on coffee plantations. They only earn the equivalent of about $0.60-$1.50 for each basket of beans they pick. A good worker may fill up to twelve 15-pound baskets per day. Ticos drink "local coffee". Although the people of Costa Rica love coffee as much as anyone else, they do not drink much of the exported product. Local coffee has a government-controlled price, much lower than coffee packaged for export. To keep the price-controlled beans from being exploited as foreign trade, local coffee is tinted. Some of the local coffee name brands in Costa Rica are Cafe 1820, Cafe Rey, Volio, Cafe Montaña, Yodito and Cafe Maravilloso. These coffee manufactures also produce export beans. Perfect soil. Perfect timing. Coffee plantations first appeared in Costa Rica in 1779. The Central Valley turned out to be an area with near perfect soil and climate conditions for the production of coffee. Successful crops were almost guaranteed. As a nonperishable commodity, coffee could endure slow transportation, making it an ideal product to export from Central America. 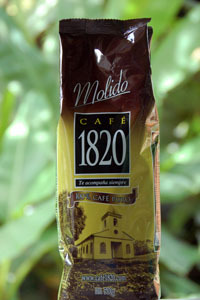 By 1829 coffee had surpassed tobacco, sugar and cacao (chocolate) as the principle source of foreign revenue, turning plantation owners into Costa Rica's wealthy elite. The coffee eventually caught the eye—or taste buds—of post-World War II Britain and soon exploded onto the international scene. Multi-national retention plan launched in 1989. Costa Rica, Guatemala, Nicaragua, Honduras, and El Salvador sell their coffee in installments. This retention plan ensures price stability. The plan was created in response to the 1983 blight, which caused a collapse of the world quota cartel system. World coffee prices plunging 40% and families dependent on coffee were deeply affected by unstable price fluctuations. Nowadays, coffee is said to be the second highest traded commodity in the world (out-ranked only by petroleum). Roughly 2% of the world's coffee comes from Costa Rica and it ranks 13th among world coffee producers. What is to become of Costa Rican coffee? Beloved Costa Rican coffee beans may be disappearing. Some of the best coffee plantations are positioned in or near Costa Rica's expanding capitol city of San Jose. Real estate prices are ever-rising in the urban provinces of Cartago, Alajuela and Heredía, pushing farmers to sell their land. Traditionally agricultural countryside is slowly giving way to cityscapes. Costa Rican coffee plantations may eventually become casualties of urban sprawl. Put your money where your mouth is—literally. If you are one of the millions of people who love Costa Rican beans, offer a supportive tip of your coffee cup.